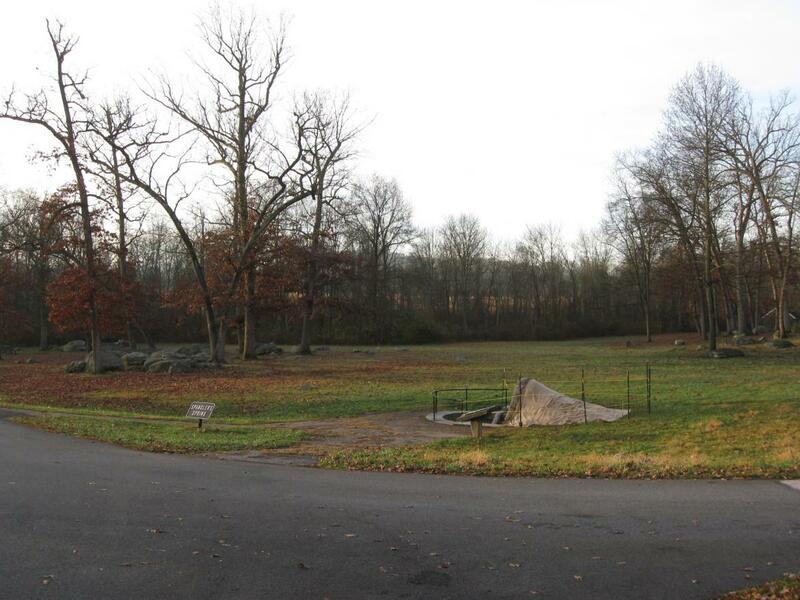 Here is how the Spangler’s Spring area appeared at the time of the battle taken from James McAllister’s Field near the Baltimore Pike. Lower Culp’s Hill (Spangler’s Hill) and Wolf’s Hill are now clearly visible in the background as is Spangler’s Meadow. Two regiments charged out of McAllister’s Woods on the morning of July 3, 1863 towards Lower Culp’s Hill/Spangler’s Hill. The 2nd Massachusetts Infantry Regiment charged from right to left across this open ground. The 27th Indiana charged approximately halfway across Spangler’s Meadow. Both regiments suffered significant losses. This photograph is courtesy of Licensed Battlefield Guide John Archer. This Tyson photograph was taken facing northeast circa 1866. 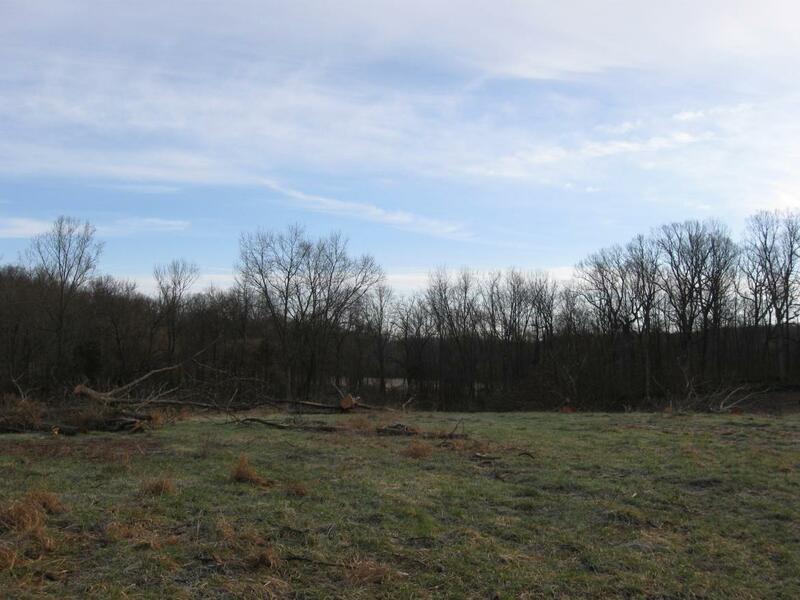 With all the tree cutting in the Culp’s Hill area, we were wondering why the Spangler’s Spring area, whose restoration to 1863 would be one of the most dramatic areas, had not cut its trees down yet. National Park Service spokesperson Katie Lawhon gave us an answer this week. The main cause of the problem is the low ground where the trees are located. This more recent photo shows the same view as the previous photograph. We’re waiting for these final trees to be removed between the McAllister Farm and Spangler’s Spring, which is barely visible in the center of this view. 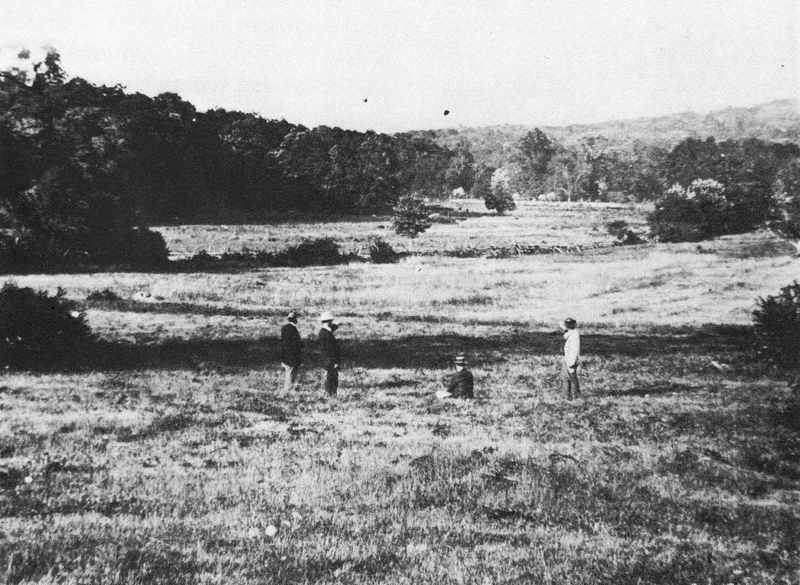 Lower Culp’s Hill, or Spangler’s Hill, is visible through the left background. Wolf’s Hill is visible in the right background. McAllister’s Woods is in the right foreground. This view was taken facing northeast at approximately 8:00 AM on Monday, April 13, 2009. Here is a view from the east side of Spangler’s Meadow. 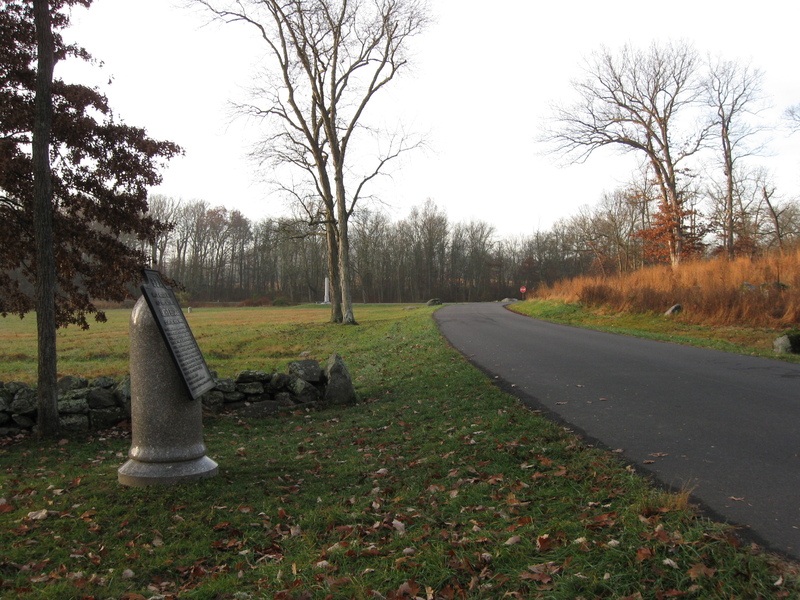 The marker for Smith’s Virginia Brigade is on the left of East Confederate Avenue. Lower Culp’s Hill is on the right. In the background above the stop sign is an orange “line” running from right to left. This is James McAllister’s Field. We would like these trees to be removed so that we could see McAllister’s Field and the Baltimore Pike area more clearly. We e-mailed Katie Lawhon about the timetable for these trees between Spangler’s Meadow and McAllister’s Field to be cut down. This view was taken facing west at approximately 8:00 AM on Sunday, November 15, 2009. 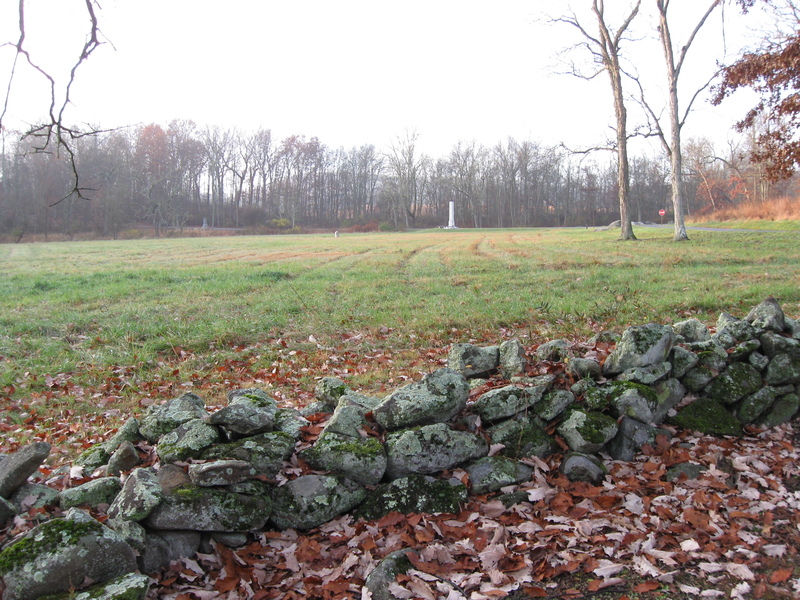 This view is from behind the stone wall on the east side of Spangler’s Meadow. The Indiana State Monument is the light colored monument near the center of this view. Katie’s response to our question is as follows: “Contractors will begin removing trees in this area once the park gives them the go-ahead.” This view was taken facing southwest at approximately 8:00 AM on Sunday, November 15, 2009. Here’s Spangler’s Spring. Behind the trees is seen the “orangeish” McAllister Field and the outline of Powers’ Hill. Katie’s response continues: “We need the ground in this area to either dry out more or to freeze. This is how we minimize soil disturbance in the areas where our contractors cut trees.” This view was taken facing southwest at approximately 8:00 AM on Sunday, November 15, 2009. 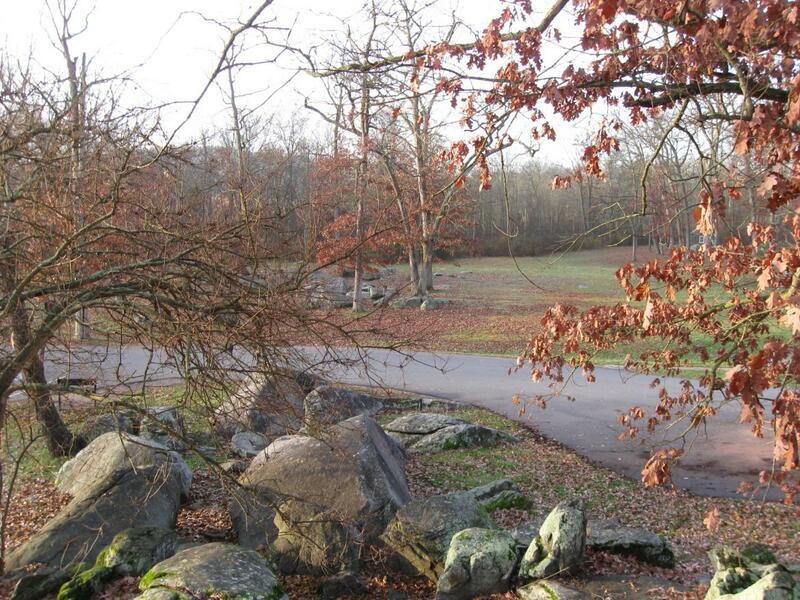 This view is from lower Culp’s Hill near the monument to the 1st Potomac Home Brigade. Katie’s response about the trees in the background being cut concludes, “Your guess is as good as mine on when either of those two conditions kick in.” This view was taken facing southwest at approximately 8:00 AM on Sunday, November 15, 2009.